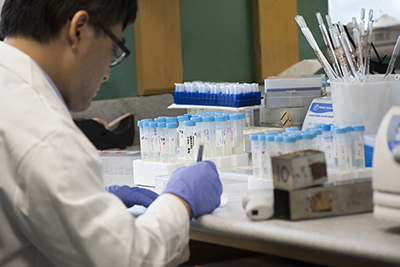 Our laboratory is interested in understanding the molecular mechanisms underlying DNA repair pathway choice. BRCA1 and BRCA2 mutations are prevalent in familial breast and ovarian cancers. Cells with BRCA1 and BRCA2 mutations are exquisitely sensitive to PARP inhibitors (PARPi). However, treatment of BRCA mutant cancers with PARPi is not curative, and resistance to therapy is a major clinical problem. Our study investigates the mechanism on the competition and coordination of different DNA repair pathways, and uncovers key components in these pathways that we can explore to improve cancer therapy and overcome therapeutic resistance. Genomic instability caused by impaired DNA damage response and/or DNA repair is a triple-edged sword. On one hand, it is a driving force for tumorigenesis. On the other hand, defective DNA damage repair renders tumor cells more sensitive to DNA damaging agents, and thus allows for the use of radiation and many chemotherapeutic agents that induce DNA damage in clinic for cancer treatment. We are working on better understand the underlying mechanism on regulation of DNA repair pathway choice and resistance to PARP inhibition in BRCA1 mutant cancers, which are critical to develop new therapeutic strategies for cancer patients. 5. Wang J, Chen J*, Gong Z*. TopBP1 Controls BLM Protein Level to Maintain Genome Stability. Mol Cell. 2013 Nov; 52(5): 667-78. 7.Wang J1, Gong Z1, Chen J. MDC1 collaborates with TopBP1 in DNA replication checkpoint control. J Cell Biol. 2011 April; 193(2):267-73. (1 these authors contributed equally to this work). PMCID: PMC3080258. 8. Gong Z, Kim, JE, Leung, CC, Glover, JM, Chen J. BACH1/FANCJ acts with TopBP1 and participates early in DNA replication checkpoint control. Mol Cell. 2010 Feb; 37(3):438-46. PMID: 20159562. 9. Huang J1, Gong Z1, Ghosal G, Chen J. SOSS cooperates with RPA to maintain genomic stability. Mol Cell. 2009 Aug; 5(3):384-93. (1 these authors contributed equally to this work). PMCID: PMC2756616. Zihua Gong, MD, PhD, was recently awarded a new grant from the National Cancer Institute, part of the National Institutes of Health, to continue his research related to BRCA1- and BRCA2-associated breast and ovarian cancer.